Vertically growing plants are an attractive feature of many vegetable gardens as well as being an excellent space-saver. Climbing peas and beans (especially runner beans beans) can be some of the most productive plants you can grow, but providing strong supports for these plants is essential. When the seedlings first emerge they may seem small and delicate but by the time the vines have wound their way up to six feet tall with a thick mass of leaves and pods the supporting structure will have to be strong enough to take the weight and sturdy enough to survive winds. A huge variety of supports can be bought or built for these crops and the best option will depend on materials, time, budget and personal preferences. For ornamental gardens it will be important to consider the aesthetic aspects as vertical supports often draw the eye in a garden and can make a big difference to the appearance. At the other extreme, on allotments practical recycled solutions often rule and with a little ingenuity all sorts of ‘junk’ materials can be used to make good supports. Bamboo canes: These have the advantage of being perfectly straight up to relatively long lengths and are very resistant to weathering, lasting for years. However, unless you can grow bamboo yourself over many seasons they can be costly as they are usually imported all the way from China. Hazel or other coppiced wood: Here in the UK, hazel can easily be coppiced to provide many strong flexible hazel rods. Traditionally, hazel coppices were cut every 7 years reaching several metres high but gardeners rarely require this length and can cut it more regularly to grow their own attractive garden supports. Spare Sticks and Branches from Trees: Instead of hazel it’s also possible to use branches trimmed from trees in your garden. However, these are less likely to be as straight or flexible and may be harder to fasten together into a strong structure. Fencing: Any kind of wire fencing can be used for climbing plants as long as it is sturdy enough. If you have wire fencing along the edge of your garden already it’s the perfect support. If not, recycled fencing can be put to good use when combined with strong poles. Recycled Materials: On allotments, left over building materials such as steel rebar (the steel supports used in reinforced concrete) are often used as they are easy to drive into the ground. Spare timber can also be made into sturdy frames. Wire: More tricky to secure but very strong, wire is good for semi-permanent structures which can be moved around the garden each season. Double row: the classic structure is to plant two rows of beans or peas about 1 foot (30cm) apart and to stick canes in each side, tying them together at the top with string. I often use this method and add an extra cane along the top with a supporting ‘guy rope’ string at each end to strengthen the whole structure. Wigwam: in this arrangement plants are placed in a wide circle and the canes are either tied at the top or are fastened into a cane ring. This can look very attractive as well as adding strength in all directions. However, the ground in the middle of the wigwam is lost unless a quick growing crop is planted there before the climbing plants get going. Arch: One of the most beautiful designs, especially when peas are flowering, is to grow them up over an arch between beds or over a walkway. Arches can be costly to make and unless they can be moved they limit crop rotation to the legume and squash families (if you only want to grow edible climbing plants) but those may be sacrifices worth making if you enjoy the display. Attractive steel arches are available from many garden centres and suppliers. Wall or Fence: Climbing plants need something to wind their tendrils around so growing them up a wall or solid fence usually requires trellis or netting to be fixed to it. As long as the location receives at least 4-5 hours of sunlight a day this can be a great space saver and has the added advantage of not casting shade on other areas of your garden. Central Support: Rather like the wigwam structure a single strong pole can be the anchor for many lengths of string radiating out to pegs driven into the ground. To support the vines this needs to be strong and taut. Another method is to use other plants for support such as sweet corn. For example, in the traditional ‘three sisters’ companion planting method, beans are planted next to sweet corn and grow up the strong corn stems, while squash are grown underneath to suppress weeds and keep the roots moist. This can work well but in areas with short growing seasons it can limit you to one crop of beans since the sweet corn will only grow high enough through warm summer weather. Building your own supports is therefore often preferable as it can enable earlier crops, especially if the peas or beans are started off under cover (as I do in my greenhouse). "actually, the splayed beans structure is nothing short of genuis as the sun gets to penetrate the middle of the structure as well, helping to produce more edible crop. I shall be doing this as my project this weekend, thank you!" "Anyone have a sketch or diagram or photo of how to build the splayed system? Looks like a good way to go. Is there twine or netting up the sides, or just let the vines grow up the sticks?" "I think I will try the splayed bean structure this season. It makes great sense,uses all the space well and makes picking a bit easier. The only drawback I see is crop rotation. This doesnt look like a structure that would be easy to move, but I just have to try it anyway." "Is it necessary to rotate beans as I know someone at my allotment who has grown them in the same place for many years? He just digs out the trench every year and fills it with compost/manure and kitchen scraps." "Crop rotation isn't as important for peas and beans as it is for other crop families such as brassicas as legumes suffer from less pests and diseases. However, it's still advisable to rotate, if for no other reason than the root nodules of legumes fix nitrogen which is great for other hungry crops in following years. In the article in Kitchen Garden magazine they just had the beans climbing up poles, not up netting or twine, though there's no reason why this couldn't be added. The frame was detachable from the upright poles (by screws I think) and then poles were attached to the frame using twisted wire ties so the whole thing could be disassembled and moved to a new location in following years." 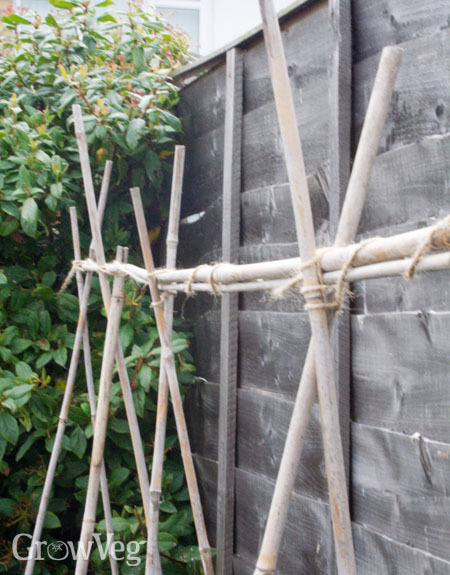 "Slayed Bean Frame (from Kitchen Garden Magazine) 14 Bamboo Canes at least 7ft (2.1m) long 2 pieces of timber 50mm x 20mm x 155cm (2in x 1in x 5ft) 2 pieces of timber 50mm x 50mm x 80cm (2in x 2in x 32in) 2 pieces of timber 50mm x 50mxx x 220mm (2in x 2in x 7ft 3in) Drill plus 5mm drill bit Screwdriver (or screwdriver bit for drill) Screws: 2 @ No. 5 x 100mm (4in) 4 @ No. 5 x 60mm (2.1/2in) Flexible garden wire, or strong rot-proof string Im making one this weekend - its looks great"
"I often hear of gardeners being successful substituting large amounts of compost for rotations for pole beans and tomatoes, but I would not try to push one's luck with peas. Several studies have shown that with peas, pathogens begin building up in the soil the first year, and get worse each season. I rotate beans/peas, tomatoes, and cucurbits on my permanent trellises, with winter cover crops in between when the space won't be needed for planting until late spring." "I've come back after a week's holiday to find that half my pea plants have been eaten - by slugs presumably. It seems to be those that fell to the ground rather than grab the supports I thought I'd given them. Should I tie new plants to the supports to start them off? Or do I need to do something else to keep the slugs away?" "Liz, slugs are most likely - in which case take a look at our article about how to tackle them here: http://www.growveg.com/growblogpost.aspx?id=28. The other possibility for eating pea seedlings is larger birds which will take the tops off them and some arrangement with netting or plastic bottles over them will help prevent this. Pea plants rarely need tying to the supports as they nearly always find their way up the supports themselves. I suggest some beer traps and perhaps setting out the seedlings when they are a little larger...?" "This is my first year growing beans and I am trying a modified "wigwam". I am taking an old circular tomato support and putting it upside down in the ground, making it look like a teepee. Anyone have any success or failure doing it this way?" "The splayed bean support looks great! We do not get Kitchen Garden Magazine here in the US. Can anyone tell me what is done with the bamboo poles at the ground level? Just pushed into the dirt fat side down is what I'm presuming. Thank you for the tips to date Jeremy and Jill." "I wonder if the wooden frame on top needs to be that high. It seems to me the bamboo supports would still hold the beans even if projecting more above the frame. Any one have any thoughts on this? The bean might want to run sideways on the frame is the only downfall I can think of." "Carla - the bamboo poles are just pushed into the ground at the bottom. That's an intersting idea about not making the wooden frame so high. As you say, you'd need to ensure that the beans continued up the poles but that should be possible by keeping an eye on them. Let us know if you try this!" "I'm trying a 'Munty' frame for the first time this year. A quick description would be that it looks similar to a football (soccer) goal, I suppose? It's supposedly easy to pick the beans as they hang down from the frame. Plenty of pictures scattered about on the web." "We got a 6' section of an old metal swing set and took all of the swings off, then painted it all a nice "garden green" color. We ran some small pieces of wood (also about 6' long) at the base, and ran garden twine from the wood up to the top steel pipe. This gives us two vertical walls of twine...then we plant the beans near the wooden members at the bottom and the vines grow right up the strings. During the peak growing season, you can barly make out the swingset...it is a big green bean machine! Works great and successfully re-used something destined for the landfill." "An easy way to build an arch is to use use rebar stakes, leaving about two feet above ground, then bend a PVC pipe and slip it over them. Easy to assemble and disassemble. A pipe attached across the top provides support and netting can be easily attached. Makes a great cold frame as well. Just use some pipe as a weight to the ends of your plastic and throw it over." "Thanks for the suggestion Ledie - that does sound good." "Carla, Kitchen Garden magazine morphed into "grow" magazine, published by Taunton Press. Seems only to appear in the spring/summer, however. " "Sorry, should have made this clear - the Kitchen Garden magazine I was referring to is a UK publication - still very much going strong! They were kind enough to give permission for us to use the photograph from the magazine." "PLEASE HELP...FIRST TIME GARDENER QUESTION: my husband wants to build a support structure using ONLY pvc pipe. Big ones up the sides, and connecting them would be skinny pipe, half inch in diameter (..well, half inch inside diameter) Is this possible, or would the tendrils not wrap around it?" "My personal feeling is that smooth PVC pipe would be too wide and slippery for pea tendrils to wind around. You could drill holes in it and could thread string through but that sounds like a lot of work... I don't have any direct experience of using piping for peas though. Anyone else tried using PVC pipe?" "I have not used pvc myself but have heard of others who say to rough up the surface 'good-and-proper' with sandpaper/glasspaper to provide a surface on which the tendrils can grip. Personally I find it cheaper and easier to use rough-sawn wood." "I loved the photo of the splayed pole bean support! I didn't want a permanent structure so I thought about it for a while and came up with my own version, using PVC, bamboo, and nylon cord for the beans to climb. Drilling holes and stringing it all together was a lot of work, so I hope the cord lasts a few years. It looks really cool, though. Two pole bean plants chose to climb the PVC instead of the cord. They are clinging to the PVC okay so far (I did not rough it up). I'm curious to see whether they'll maintain their grip on the PVC as they get bigger/heavier. I don't think my peas could hold onto PVC, but I've never tried growing a type like Telephone, maybe they could manage it?" "Why don't we use castor tree to support climbing beans. What if we plant castor tree on one row and climbing beans on the next so that the beans can be supported and grow up on the tree.Because support wood is too expensive. To plant one ha. of climbing beans we have about 70,000 plants per ha. If each need support, then supplying 70,000 support wood will be very expensive." "Tesfa, you are right in that castor beans have an open growing habit that accomodates vines. I have seen them used as supports for morning glories, so why not beans? The only catch is castor beans are very big, so you would need a lot of space, and they grow best in warm climates." "Thank you Barbara for your instant comment. I am trying this Ethiopian rainy season to plant climbing beans on 2 ha. of land with castor tree support. The site I chose is about 1500 mt. above sea level and is warm area. I will notify you on the outcome of using castor tree.I will cut most of the leaves of castor to avoid shadow." "May I ask you a question Barbara? Can you estimate yield of climbing beans per ha. with good management?" "I'm not sure what you mean by climbing beans. In the best climates for pole snap beans in the US, yields can run as high as 400 bushels per acre, but only in places with cool nights that promote good pollination. You may do better with a pea classified as Vigna unguiculata because of their heat tolerance. As a first step, I would try different beans and peas known to grow well in your area to see what works best. Also the castor beans will need a head start or the beans will smother them." "what is the actual yield of stick beans or pole beans per ha. I could not agree with with some findings that say climbing beans yield 5 tons per ha. Because it is very clear that one plant of stick beans yields not less than 200 grams. You can have about 80,000 plants on one ha. This gives 16 tons per ha. Am I right?" "The estimates I can find suggest a range of 7 to 12 tons per acre, assuming the pole beans are picked every three days, with 6 to 8 harvests. That is a lot of hand picking, which is why commercial growers favor bush beans that can be picked by machine. Pole beans give a better space return in the garden, where everything is hand picked." "I'm glad to hear that, Barbara. I didn't realize at first that pole beans are better space return for a small garden; I found out by happy accident. Couldn't get bush beans to grow for whatever reason, so I gave pole beans a try. I love the way they cram a lot of plant into a small area, but what is almost better is the way the harvest is spread out over a long period of time. Otherwise I couldn't keep up with it! :)"
"I like the idea of the splayed cane structure but why can't we use the normal cane structure with canes forming inverted VVV with a top horizontal cane for support at the peak. With two or three rows like this we can train the peas splaying outward instead of outward achieving the same effect as the splayed structure." "Sorry! I should have said "...splaying outward instead of inward..." "
"I’m didn’t do reasearch befor atempting to grow a bean teepee. Just planted very tall poll and stretched fishing line out from top attached to short stakes in ground and plan to put seeds next to each stake. Will beans grow up fishing line . I hope this will work. Let me know what you think Hoping for the best. " "Jeannie, I fear that the fishing line may cut into the vines under windy conditions. Might you be able to replace it with jute, hemp or cotton string? "